Nitrate Removal | Hungerford & Terry, Inc. Fertilizer runoff, septic tanks, and land disposal of wastes all threaten ground water and surface water with nitrates. H&T achieves very high levels of nitrate removal through a highly effective method involving the exchange of nitrates, alkalinity, and sulfates for chlorides using a strong base anion resin. Only Hungerford & Terry offers the efficiency and economy of a countercurrent regeneration system of nitrate removal. The very high efficiency of our countercurrent system and its low leakage levels, allow a maximum amount of untreated water to bypass the system to be blended with treated water. Any level of nitrate concentration below federal standards is thus readily achievable in a plant that is extremely efficient. This innovative nitrate removal system designed to your specifications will greatly reduce the size of the treatment plant. It will use as little as half of the regenerant per cubic foot of ion exchange resin as compared with a conventional system. It provides maximum efficiency while reducing waste and operating costs. Regeneration begins with a backflow of raw water through the regenerant collector to remove suspended material and to decompact the resin. A brine solution is then injected to remove nitrates and sulfates. A slow rinse then flushes out most of the brine and removes still more nitrate and sulfate. Finally, a fast downflow rinse removes residual levels of nitrate, sulfate, and brine. By fully regenerating the bottom of the ion exchange bed, leakage is reduced to a fraction of a part per million allowing greater input water bypass of the system. Cocurrent systems may be appropriate for smaller systems or when initial capital costs are a very important consideration. The basic chemistry is the same as that of a countercurrent system. In the more conventional cocurrent approach, however, regenerant brine enters from the top rather than the bottom. Thus, a cocurrent system is normally backwashed after every service run yielding a regeneration sequence that includes an upflow backwash. After the backwash, downflow brine injection is followed by a downflow slow rinse and fast rinse. 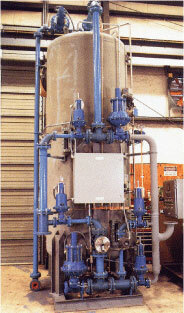 Both systems use automated valves controlled by H&T-designed control systems. Actuation can be pneumatic, hydraulic, or electrical depending on the customer’s preference. Tank linings, painting, man-hole sizes, and other features can be specified by the customer. H&T’s application-specific configurations include choices of valve operation techniques, exchanger tank options, internal distribution options, and varying degrees of automatic control. Skid mounted and assembled nitrate removal system ready for shipment to Wisconsin.